For Kobo, today was the day the Toronto-based company had its latest e-reader leak online with a set of images and an Federal Communications Commission (FCC) filing; for you it was Tuesday. German site Lesen.net first posted the images of the unnamed device, which has a new look vastly different from that of the Kobo Glo, and more reminiscent of the Kobo Aura HD. The e-reader shares some of the same contour design with the Aura HD, and even has a similar power switch, though the Kobo device in the images appears to have a more textured case than the Aura HD. There's also a microSD slot and a microUSB port visible on the bottom of the device, and what could be a separate button for the front-light is visible on the side of the e-reader. Leaked photos don't tell the entire story though, and the FCC's listing has a bit more to offer in the way of pertinent details. 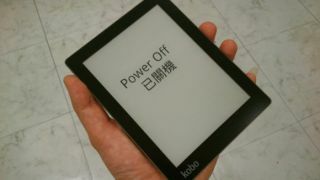 According to the FCC, this latest e-reader will feature a 6-inch screen, which could be identical to the 1024 × 758 HD screen found in the Kobo Glo. The device will also feature a 1,500mAh battery - which is clearly better suited for on-the-go reading than the 1,000mAh battery in the Glo - and will support Wi-Fi. There isn't much else to discern from the filing at the moment, as the FCC stated more critical information is under embargo until Aug. 30. With just a little over a month until that date, it's likely Kobo will make a more formal announcement of its mysterious new e-reader between now and then. Perhaps there will be a surprise or two in store with an actual reveal, but until that happens, we'll just have to hope this new e-reader has more to offer than a bigger battery. Which tablet has been the best of 2013? Check out our comparison to see which tablet comes out on top.